Note: Choose crayons that have strong color and good wax content—Crayola crayons were used in this lesson. The most brilliant colors work best. Black crayon should be avoided since it won't show up against the black tempera paint. Cut the paper for the engravings into 8- x 10-inch pieces, planning one for each child plus a few extra for demonstration. Add approximately one tablespoon of liquid soap to each pint of black paint. Test the paint to be sure it adheres to the crayoned surface and can be engraved without chipping. Cover a paper with crayon before class for demonstration. Set out cut paper, crayons, newspaper pads, tissues, black paint, and brushes. Explain to the children that an engraving is made by scratching a design into a surface to produce a picture. In this session the children will put a thick layer of crayon on their papers, and then apply a coat of black paint. In the next session they will make engravings by scratching into the black paint, revealing the colors below. Demonstrate how to prepare the paper by first placing it on a newspaper pad. 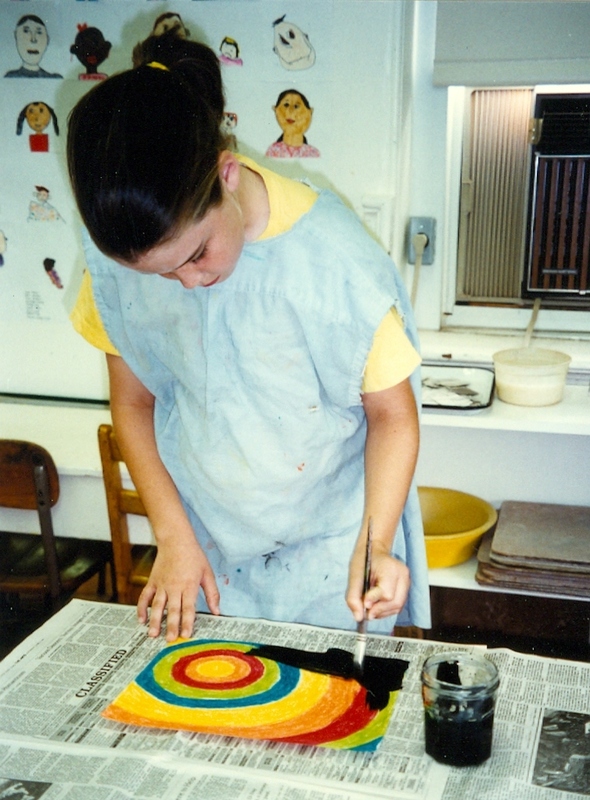 Using a light colored crayon, mark off sections on the paper by either making a scribble design or creating a pattern, such as concentric circles or squares. Explain that the children should fill in the resulting shapes with a variety of bright colors, using a limited or full range of colors depending on the mood or effect desired. It is important to use strong pressure when applying the crayons to build up a thick layer of wax; the crayon must be applied evenly, leaving no paper peeking through. When the papers are completely covered, use a tissue to lightly brush away any little flecks of crayon on the surface. On the prepared demonstration paper, show the children how to cover the crayon with a layer of black paint. Spread the paint gently and evenly across the surface, being sure all areas are covered with no puddles of paint left behind. Have the children put their names on the back of their papers, apply the crayon, and then paint the surface with black paint. Set out the dried papers and the demonstration paper from the previous session. Cut the newsprint paper into 8- x 10-inch pieces. Set out the newsprint paper, pencils, and tools for engraving. 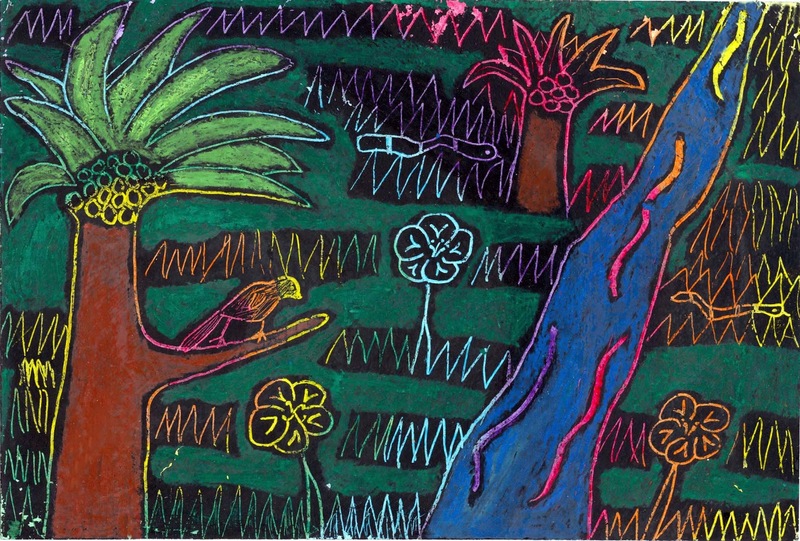 Explain that in this session, the children will be making their engravings by using tools to scratch through the black paint, exposing the colors underneath. Preliminary drawings should be made on newsprint paper using only basic outlines. For example, draw the shape of a tree, but not the individual leaves. Transfer the drawing by covering the back of the newsprint with white chalk and placing it, chalked side down, on the black tempera-coated paper. Go over the lines of the drawing with a pencil, leaving a white outline on the black surface. Use a tool to engrave the outlines into the black surface. Engravings are most effective when there is an abundance of details filling the papers. Discuss the many patterns (designs made by repeating symbols), and textures (the visual feel of a surface) in everything around us, such as leaves on a tree, bricks in a building, stars in the sky, and waves in an ocean. On the demonstration paper, show the children the variety of lines that can be achieved by using different tools. Thin lines can be made with the pointed tools and solid areas can be removed using the Popsicle sticks or small screw drivers. 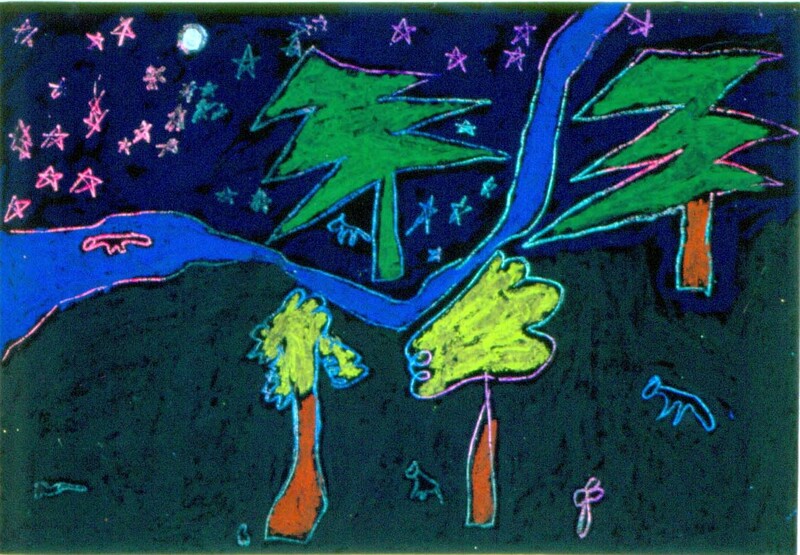 Have the children plan their compositions, transfer them to the black tempera-coated paper, and begin engraving. Encourage them to work on all sections of the paper, gradually building up details and patterns to keep the final designs balanced. Set out engraved papers and engraving tools. 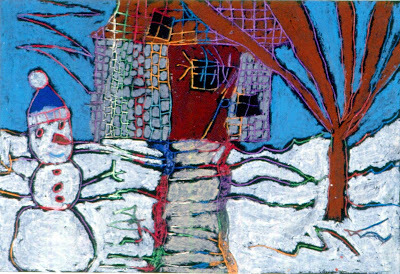 Set out oil pastels and pads of newspaper. In the following sessions, the children will complete their engravings and then enrich them with oil pastel colors. 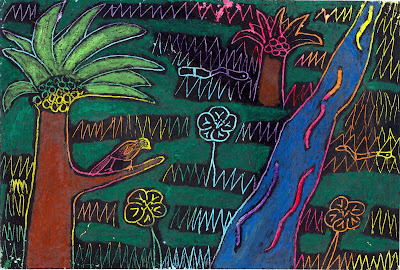 Explain that oil pastels can be applied over some of the black tempera surfaces. Place the engraving on a pad of newspaper to make it easier to put on the oil pastel. It's important to work carefully so as not to cover the bright colors of the already engraved areas. 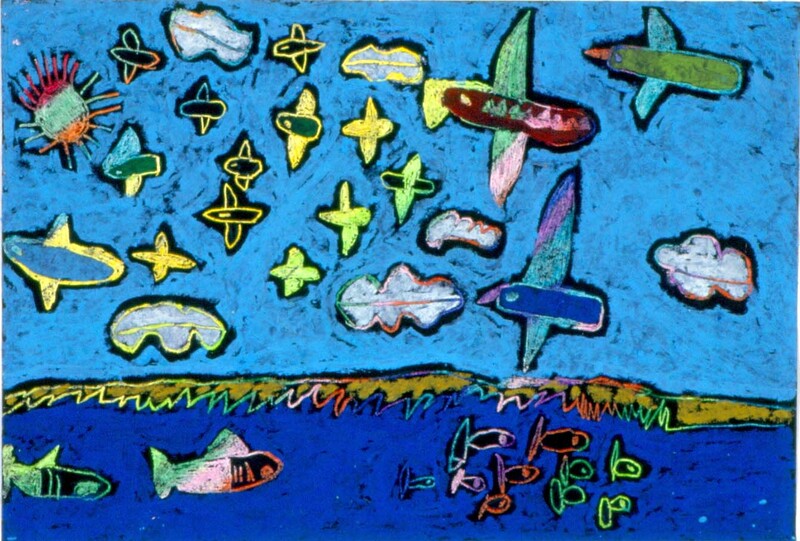 Have the children continue to add details, patterns, and textures to their drawings and then apply oil pastel to complete their engravings. For this project to be successful, it is important that the papers are covered with lots of evenly coated wax. 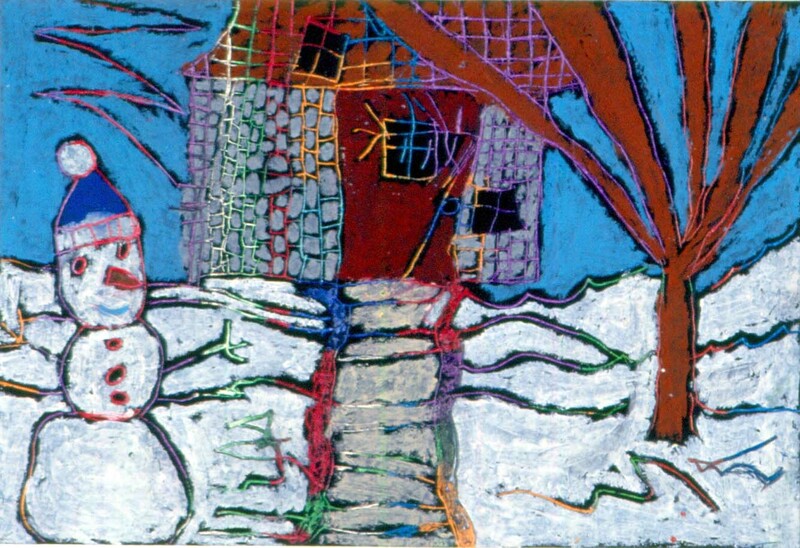 The tempera paint cannot be scratched off areas with insufficient wax. Be sure the children put their names on the back of their papers before applying the black paint. Keeping the size of the paper small allows the children more time to fill the engravings with lots of patterns and textures. 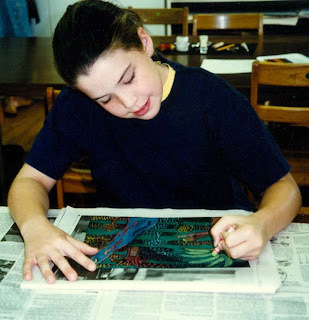 When making the preliminary drawings on newsprint, remind the children to use only basic outlines, saving the details, patterns, and textures for their engravings. Scratching off the black paint can be slightly messy, so it is easier to clean up if the work is done on sheets of newspaper. 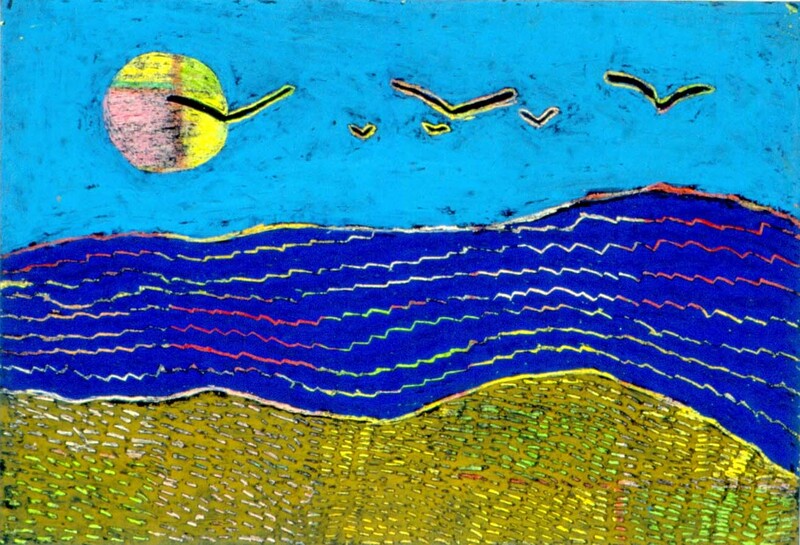 Although this project is similar to using commercial scratch-art paper, having the children prepare their own papers gives them a better understanding of the engraving process. In some instances, the picture may be further enhanced by engraving patterns and textures through the areas of oil pastel as seen in the sand on the beach in the picture below. Review the process that was used to make the engravings. Discuss how the use of patterns and textures add interest to the engravings. My hand is getting tired from pressing the crayon so hard. How can I get rid of a mistake? 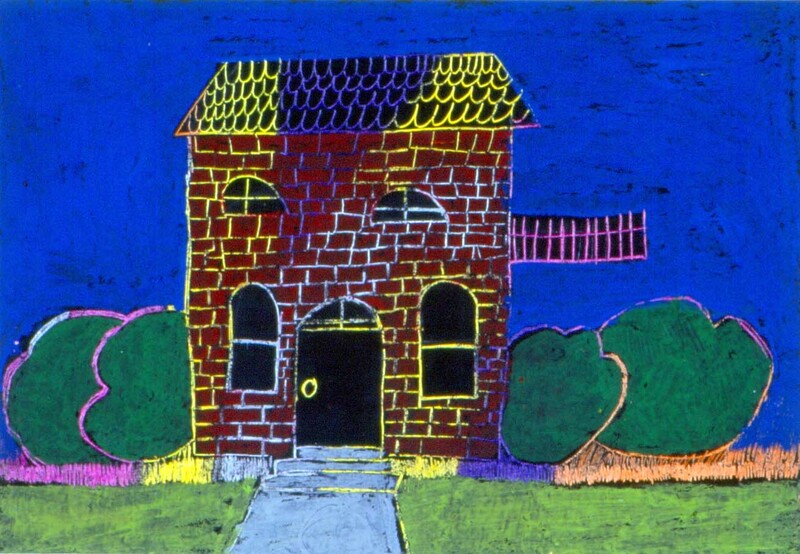 I’m going to draw the bricks on my house after I add the oil pastel. If your hand is getting tired, stop to wiggle and stretch your fingers for a few minutes. Since a mistake cannot be erased, you might try adding lots of patterns and textures around it to blend it into the design. 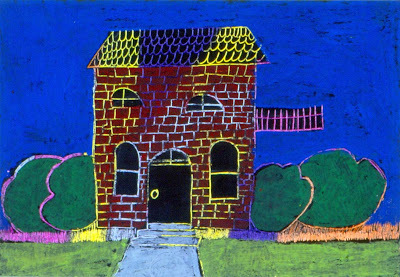 Adding the oil pastel before you draw your bricks will certainly be a lot easier than trying to color in each brick.